SurfAid International was founded by surfers on holiday that visited the Mentawai Islands off the western coast of Sumatra in Indonesia and found dreadful misery, poverty, and death beyond the palm-fringed shores of their so-called surf paradise. The ravages of malaria and other preventable diseases and inequality of lifestyles moved them by compassion to start SurfAid. Registering as a non-profit organization in New Zealand in January 2000 and later expanding offices to Australia, the United States, and Indonesia, SurfAid works to improve the health of the Mentawai people and to encourage and coordinate the support of the global surfing community. SurfAid embodies the positive values inherent in surfing, namely individualism, courage, dynamism, and adaptability, and seeks to harness these attributes in implementing projects with measurable results. A grassroots organization, which recognizes that its strength lies in the strong participation of its members, SurfAid also is committed to research and evidence-based planning. Research conducted includes survey work, study of malaria-carrying mosquitoes in the Mentawais, and testing of malaria parasite levels in current and future target villages. Through the efforts of SurfAid, malaria initially was reduced by 75% in two villages, and the Malaria Control Project then was expanded to numerous other villages. Phase one in SurfAid’s Malaria Free Mentawai Program ended with over 14,000 mosquito nets distributed and 37,000 beneficiaries reached. Other projects include the Childhood Health Project, which is now in 27 villages, and delivered about 6,000 immunizations in one year alone, as well as healthcare for pregnant women, childhood monitoring and nutrition, and health worker training. SurfAid also has a Medical Supplies Project, donating various health equipment and supplies. The latest milestone is the establishment of Care Groups in each of 53 beneficiary communities as part of the SurfAid Community Based Health Programs. The Care Group model empowers women to educate their communities on how to treat and nourish their families, which would result in preventing childhood mortality and consequently lead to a better life for the family. In response to two powerful earthquakes that struck the region of the Mentawai Islands September 12 and 13, 2007, SurfAid International immediately mobilized. It has visited and assessed more than 100 Mentawai villages and launched eight relief boats delivering food, shelter, medical attention, fuel, and building supplies to some of the 30,000 displaced residents. 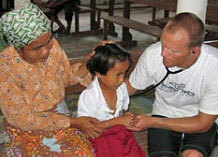 In taking the decision to present SurfAid International with its 2007 Humanitarian Award, the Awards Committee and the WANGO International Council were impressed with the compassion and successful effort of SurfAid to address the dire health situation of the Mentawai people, with their high childhood mortality, the ravages of malaria, poor education, and poverty. SurfAid’s unique cutting edge solutions to alleviate the human suffering in the Mentawai Islands, and now Nias Island, promoting community-based solutions and tapping into the inherent values in the surfing community—individualism, courage, dynamism, and adaptability—is an example of humanitarian service that deserves widespread recognition. WANGO is delighted to recognize such efforts and bring greater worldwide awareness of the extraordinary accomplishments of SurfAid International.